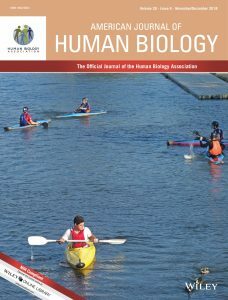 Have you checked the cover image of the latest issue of the American Journal of Human Biology (volume 30, issue 6)? In the referred image you can see some young people enjoying the sport of kayaking on the Mondego River in Coimbra, Portugal. The photo was submitted by Daniela Rodrigues in the same issue where the short report Child participation in sports is influenced by patterns of lifestyle‐related behaviors (by Daniela Rodrigues, Cristina Padez, Aristides M. Machado-Rodrigues) was published. See the first pages, including the cover of the issue, here. You can know more about AJHB while visiting their official website.